Ukrainian League 2016/17. 8th round. September 18, 2016. Poltava. Butovskyi Vorskla stadium. Att: 11,000. 12oC. Given the busy fixture schedule, the head coach of Shakhtar Paulo Fonseca made four changes in the line-up. This time, Ivan Ordets appeared as central defender. In the holding area, Taras Stepanenko was replaced by Maksym Malyshev,Viktor Kovalenko – by the Brazilian Dentinho. Eduardo appeared as an attacking spearhead. For the first time ever, the captain's armband in the absence of Darijo Srna and Olexandr Kucher went to Andriy Pyatov, who became Shakhtar’s 35th captain in the history of Ukrainian championships. The Pitmen quite easily coped with the hosts’ starting pressure and getting the ball under control, they moved the game to the home side’s half of the pitch. Particularly active were the flanks, where Ismaily and Bohdan Butko connected to the team’s attacking moves. After the latter’s delivery, there appeared the first danger near Vorskla’s goal. The Poltava keeper was just a split second faster than Eduardo’s teammate on the ball. In the 13th minute, Ismaily also got in the thick of it. After a long ball kickoff, they put him through within a shooting range, only to see the ball go just wide. Shortly afterwards, Fred put on a beautiful display. He easily beat two defenders and fired a powerful shot from outside the box just to see his effort go over the crossbar. On 31 minutes, the Orange-and-Blacks had a great chance to open the scoring. Taison passed it to Dentinho, but the number 9 sent the ball above the target. The ending of the first half passed with Shakhtar attacking, although the teams left for the break with 0-0 on the scoreboard. Already in the early stages of the second half, Paulo Fonseca had to make a forced substitution. Yaroslav Rakitskyy got injured, with Olexandr Kucher coming on instead. 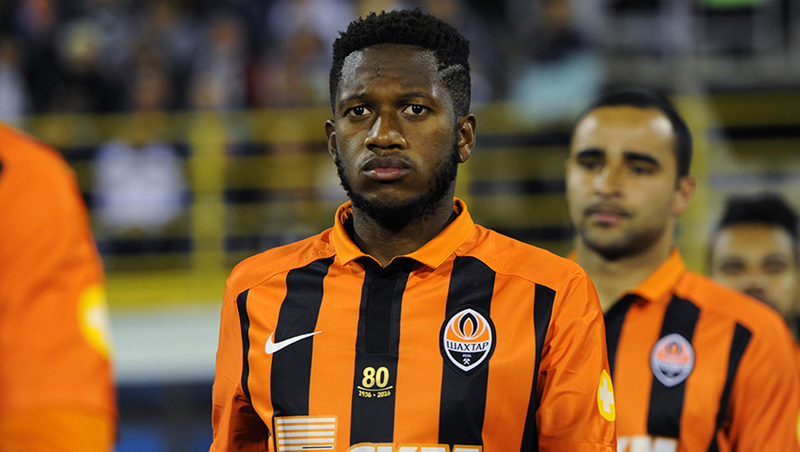 This appearance is the 150th for the Pitman in Shakhtar’s shirt in the Ukrainian league. On 54 minutes, the Orange-and-Blacks opened the scoring. Taison rounded off the visitors’ lasting attacking move with a precision shot into the near corner of the net. Just then, thanks to Marlos’ individual brilliance, the Donetsk side might well extend the lead. On the first occasion, Dmytro Nepogodov stopped the Brazilian’s attempt, with Sanjar Tursunov knocking the ball away from the unguarded goal on the second one. Eduardo was also unlucky in the 65th minute, being just inches away from flicking in Ismaily’s left-hand cross. Maksym Malyshev could have scored one from a four-metre range after another attacking move. But the goalkeeper of Vorskla rescued his team. In the closing 15 minutes of the match, Shakhtar players somewhat reduced their pace, still continuing to threaten the keeper though. Fred, Taison and Marlos were particularly active. The Poltava team tried to reverse it, but the defenders and Andriy Pyatov were immaculate. The final whistle marked Donetsk’s narrow win. The Pitmen will play their next match in Lviv on 24 September. Shakhtar are to receive Volyn in the Premier League round 9. The meeting kicks off at 17:00.